Unlike a classic round shape, a square watch manages to nail a smart, sophisticated aesthetic all the while remaining unique and modern. A sleek vintage square piece may pair nicely with a suit at the office, while a more sporty design will accompany you through your outdoor adventures. Whichever way you lean, we have rounded up the best square watches for men to help influence your decision. 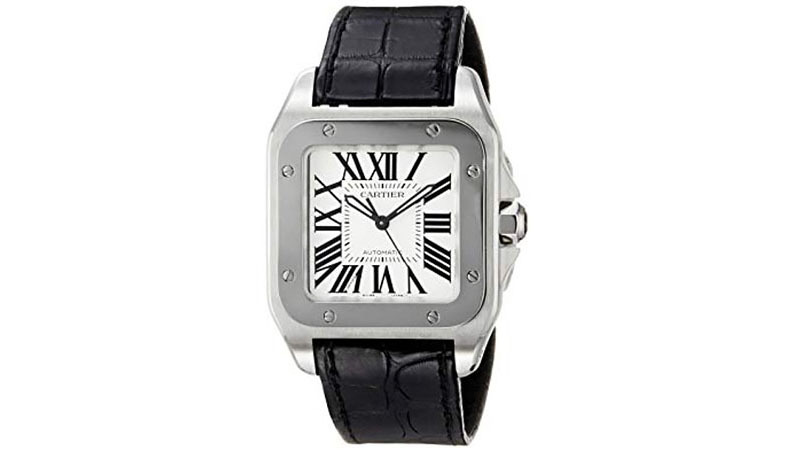 As sturdy as it is sleek, the Cartier Santos Automatic Watch features a solid square stainless steel case and a genuine black alligator leather strap. The timepiece is Swiss made with Cartier Calibre automatic movement, features scratch-resistant sapphire crystal, and is suitable for snorkelling and swimming with water resistance to 100m. Aesthetic features include a Roman numeral silvered opaline-white dial, luminous black-outlined sword-shaped hands and a studded stainless steel bezel. Additionally, the watch can function without a battery. If you’re ready to leave dry land and take your adventures below sea level, the BR-01-93 can meet the challenge with water resistance to 100m. 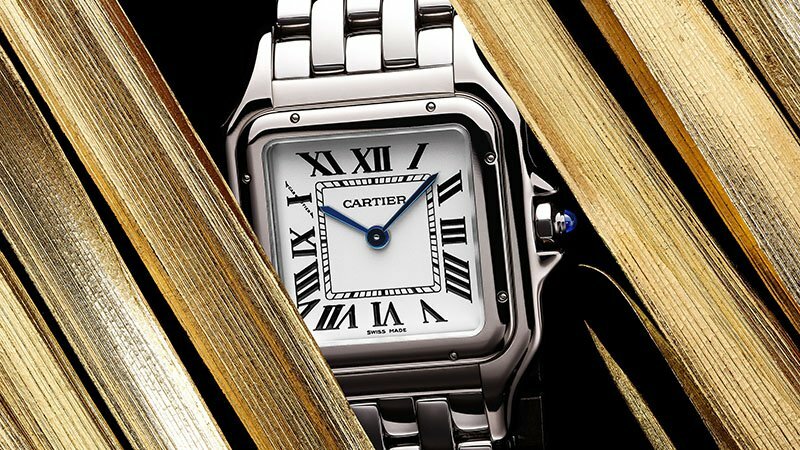 Additionally, an anti-reflective sapphire crystal dial contributes to the incredible functionality of this piece, which is as stylish as it is reliable. The watch harnesses an automatic movement and features a black carbon coated stainless steel case and white Arabic numerals and indices. A black GMT dial is supported by a screw-in case back, black rubber strap and pin buckle clasp. Versatile enough to round off any outfit, this accessory makes a confident companion for any man’s wrist. 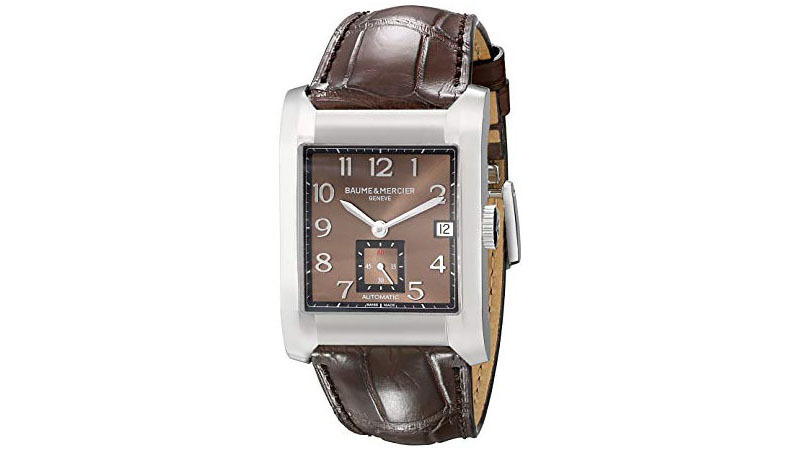 For the man who loves to look polished, Baume & Mercier’s 10028 Automatic Watch is the ultimate accessory for any occasion. Refined, strong and incredibly sophisticated, this stunning timepiece features a brown leather alligator strap, brushed stainless steel case and screw-in case back. A brown dial is paired with silvertone luminescent hands and markers and Arabic numerals to ensure a functional, easy-to-read design. With water resistance to 50m, scratch resistant sapphire crystal, Swiss automatic movement and a power reserve of 40 hours, this tough timepiece is built to withstand even the toughest of conditions. 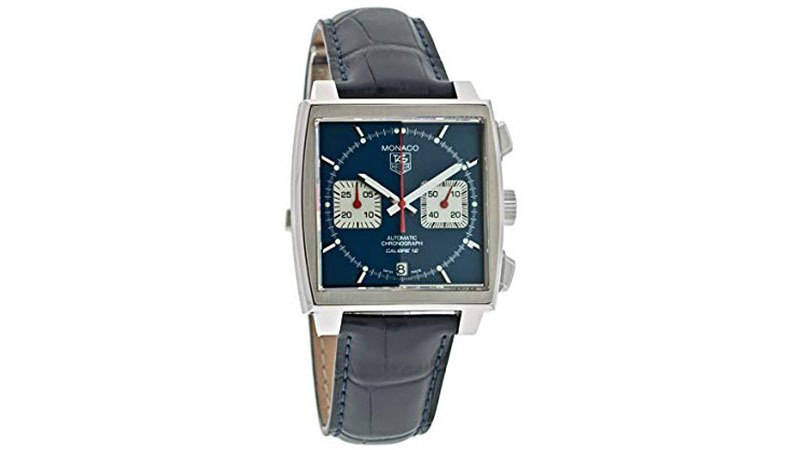 A stainless steel square case and blue alligator leather strap come together to create the stunning TAG Heuer Monaco Calibre 12. This timepiece harnesses a Swiss made automatic movement with a 40-hour power reserve. Scratch resistant sapphire crystal and water resistance to 100m ensure this watch is the perfect accessory for any type of adventure. Other notable features include a fixed brushed steel bezel, skeleton case back, blue analogue dial with silver-tone hands and luminescent dial markers. After a timepiece that can stand up to your water activities while also looking great on dry land? 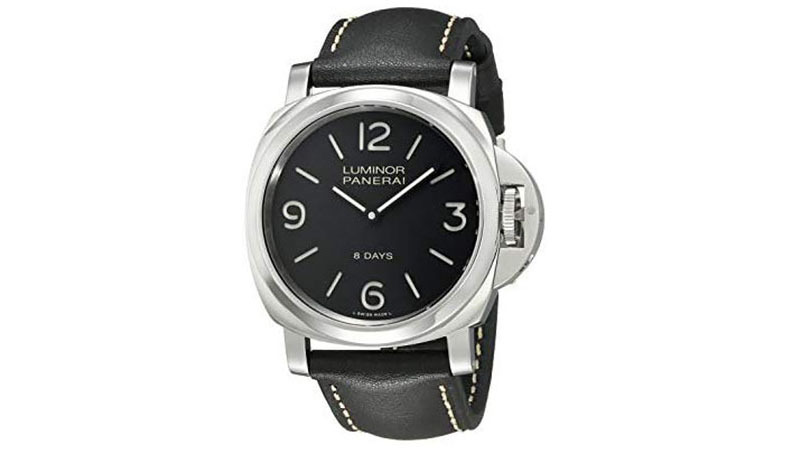 Panerai’s PAM00560 Luminor Watch is what you need. This watch features a 44mm stainless steel case with an anti-reflective sapphire dial window. The analogue watch boasts a black dial with luminous black hands, a cushion shaped case with stencil hour markers, a translucent case back and interchangeable stitched leather and logo-embossed bands. Along with being water resistant to 300m, this robust timepiece harnesses an eight-day power reserve and mechanical hand-wind movement. 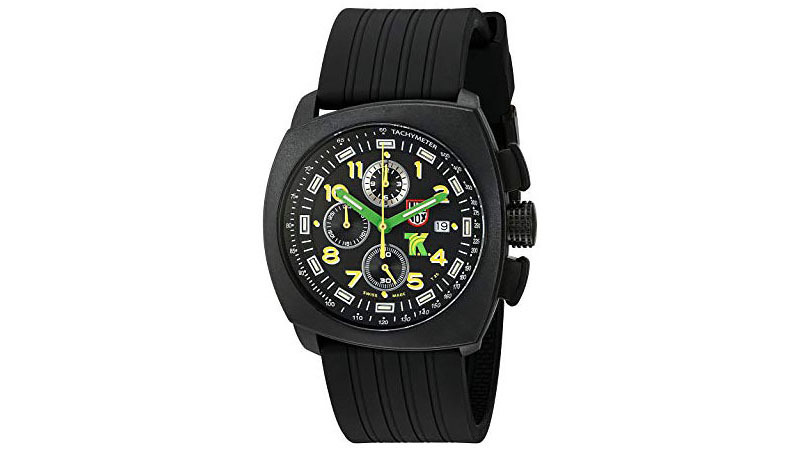 Function and style meet comfort with the Luminox Tony Kanaan Resin Watch. This timepiece is water resistant up to 100m, making it perfect for swimmers. 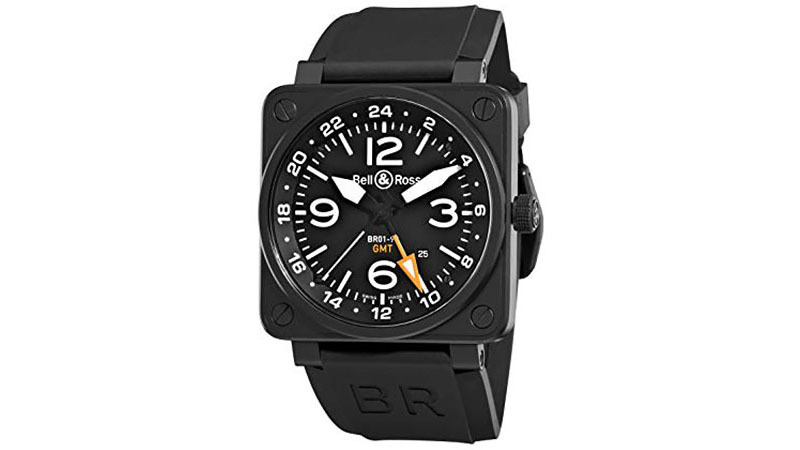 Features include a stainless steel 45mm brushed case, black silicone strap with black PVD-plated stainless steel signature buckle, an anti-reflective sapphire glass coating and screw-in case back. Completing its sporty appearance is a black dial with luminescent hour markers and green and yellow dial hands. The watch boasts night vision tubes, which will enable you to read the time in dark surroundings for up to 25 years. Finally, it harnesses a Swiss-quartz movement. 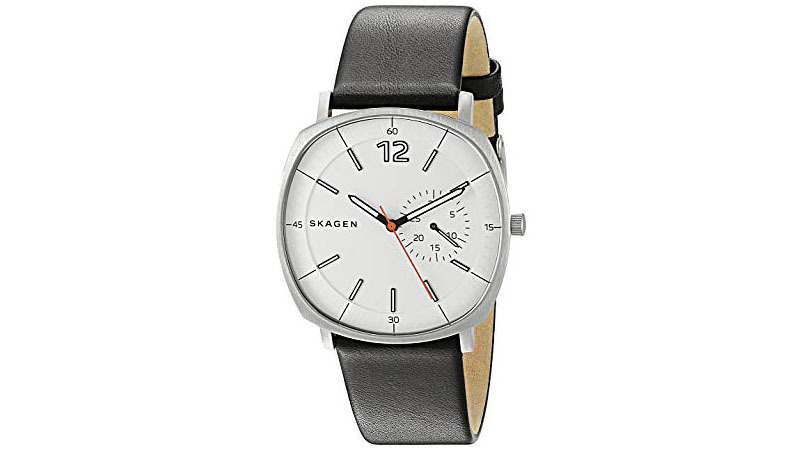 The Skagen Rungsted SKW6256 Watch merges a fashionable design with a sleek finish. Built for endurance, it boasts an analogue-quartz movement, 40mm stainless steel case and a leather calfskin band with buckle closure. Additionally, it is water resistant to 50m. This expertly crafted watch features a three-hand analogue display, a white dial with black-tone hands and hour markers, and Skagen detailing. No look would be complete without the addition of this timepiece! 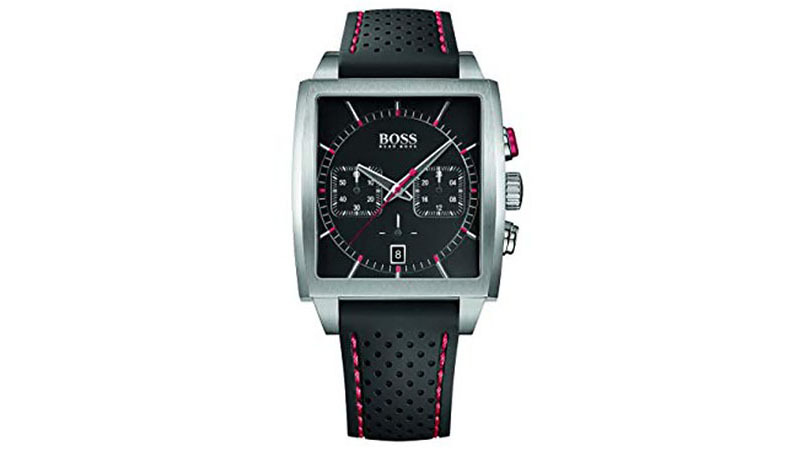 The classic Hugo Boss Rectangular Chronograph Watch is the perfect companion for the dark, brooding man. This three-hand watch features pops of signature HUGO red, scratch resistant mineral crystal, a stainless steel case and silicone strap. A buckle clasp closure and mineral dial window accompany a sleek rectangular case. As well as telling the time, the timepiece is water resistant to 50m and features a Quartz movement. Lend a stylish twist to any ensemble with this unique design. 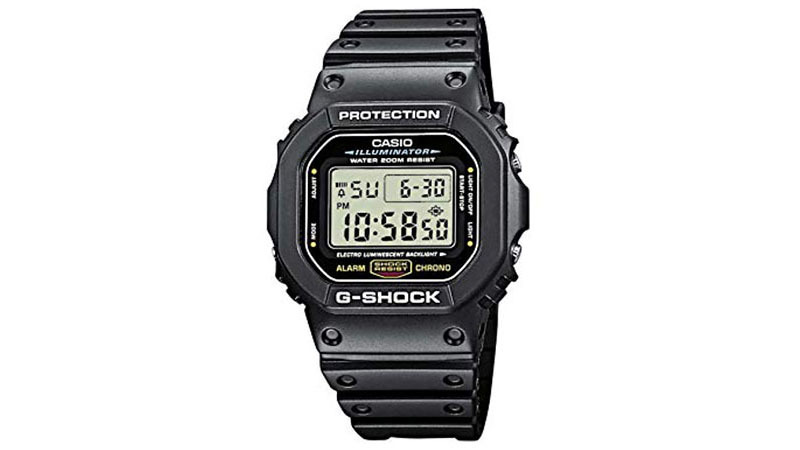 There’s a lot to love about the classic Casio G-shock Resin Sports Watch. The simply designed timepiece offers shock resistance that’ll keep up with your most vigorous sporting adventures. The durable rectangular black watch case is 45mm wide, and it’s matched to a black resin strap. It features a stopwatch function that can measure time down to 1/100 of a second and a countdown timer with a 24-hour range. Other timekeeping characteristics include an hourly time signal (which can be turned off), multi-function alarm and 12/24-hour formats. Afterglow backlighting and water resistance to 200m will stand up to the rigours of recreational scuba diving. 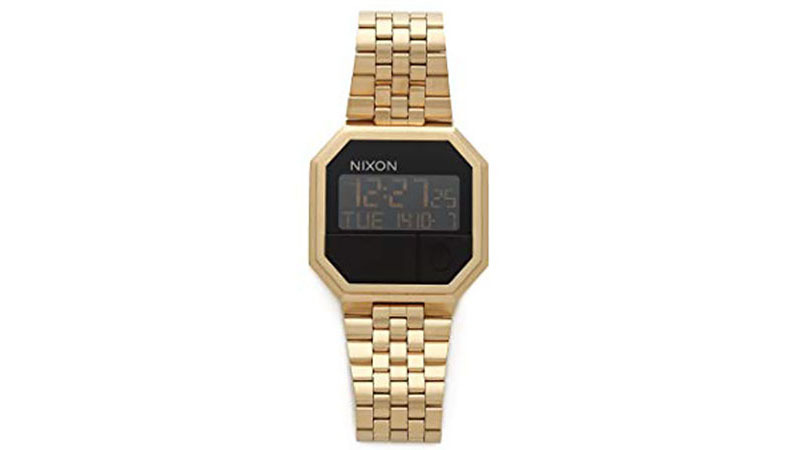 Reminiscent of the 80’s, the black and gold Nixon A158 is a bold and impressive timepiece. Along with a stainless steel bezel, this wristwatch features an automatic self-winding movement, buckle clasp closure and a countdown function. It also boasts an LCD dial with mode and light controls. It’s stylish enough to wear in the office, to functions and more, while also offering 30m of water resistance. On top of that, the watch features a 5-link band and stationary bezel function.